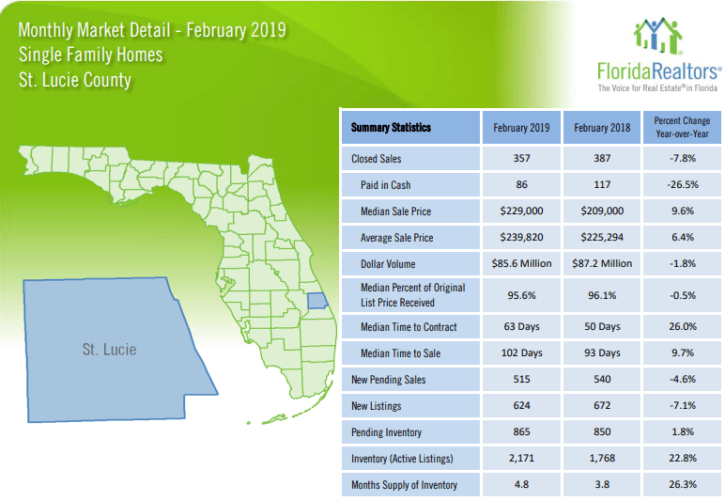 St Lucie County Single Family Homes February 2019 Market Report had weaker sales activity when compared to last year. Closed sales were down by 7.8% (in January they were down by 11.8%) and new sales under contract (new pending sales) decreased by 4.6% (they were also down by 4.6% last month). Prices. though, continued to rise, though at a more sustainable pace. The median sales price was up by 9.6% (was up by 5.4% in January). The average sales price was up by 6.4% (it was up by 5.0% in January). The number of available home listings decreased by 3 homes to 2,171 homes. This inventory is 22.8% higher than last year. The current supply of homes is 4.8 months (it was 3.8 months last year). The St Lucie County single family home market remains in a sellers’ market. A balanced market is one with a 6 to 7 month supply of inventory.